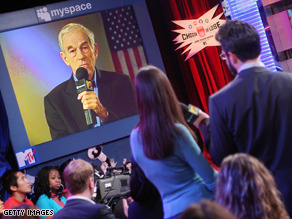 Ron Paul is urging his supporters to pick a third party candidate. WASHINGTON (CNN) – Texas Republican Rep. Ron Paul will call on supporters to back a third party candidate for president Wednesday, rejecting his own party’s nominee and offering equally harsh words for the Democratic candidate. Paul, who unsuccessfully sought the Republican presidential nomination, will tell supporters he is not endorsing GOP nominee John McCain or Democratic nominee Barack Obama, and will instead give his seal of approval to four candidates: Green Party nominee Cynthia McKinney, Libertarian Party nominee Bob Barr, independent candidate Ralph Nader, and Constitution Party candidate Chuck Baldwin, according to a senior Paul aide. The announcement will take place in the morning at the National Press Club in the nation’s capital. Paul will offer this open endorsement to the four candidates because each has signed onto a policy statement that calls for “balancing budgets, bring troops home, personal liberties and investigating the Federal Reserve,” the Paul aide said. John should have know better than to pick a child woman. Sarah is charming, but she's not ready. The press will eat her for lunch. Especially since she's playing with fire. YOU NAIVE O.B. SUPPORTERS. OBAMA IS THE ONE TO PUT US IN WORLD WAR 111 YOU MORONS.HE IS A DIRTY CHICAGO POLITICIAN. ALL HE KNOWS IS TO DIRT SOMEONE AND DO WHAT HE CAN TO DISTROY SOMEONE.HE DID THE SAME THING WITH HELP OF DNC TO PUT HRC OUT,JUST LIKE HE CUT THROATED OTHERS IN CHICAGO. YOU MORONS BETTER GET YOUR FACTS ABOUT OBAMA. THE MEDIA IS SHOVING HIM SO FAR UP THEIR --S ,THAT THEY ARE KEEPING MANY THINGS FROM THE PUBLIC ABOUT O.B. THEY HAD THIS ALL PLANNED IN 2007 WHEN O.B. SAID HE WOULD RUN TO FIX HIS NOMINATION. YOU MORONS ARE SO BRAINWASHED FROM YOUR PUPPET MASTER. HRC HAD KNOW CHANCE WITH THE MEDIA AND DNC. THAT SHOWS YOU WHAT KIND OF ARROGANT S.O.B. HE IS. OBAMA IS FOR HIMSELF AND DIDN'T WANT HRC TO SHARE HIS HISTORY. HE IS A BIAS JERK TOO. MCCAIN DONT TRASH HIS OWN. REP'S ARE MORE UNITED AND THEIR NOT HATERS LIKE O.B. 'S FOLLOWERS. WHAT WAS O.B'S EXCUSE FOR NOT PICKING HRC? ITS JUST WHAT I SAID.BIDEN ALSO VOTED FOR IRAQ. OBAMA SHOWS ME OLD DIRTY POLITICS STILL. MCCAIN AND PALIN IS FOR REAL CHANGE. COUNTRY FIRST THOUGH. Ron Paul should have been the Libertarian candidate. You need to have a blog where people can comment on Palin and the mainstream political candidates that are being discussed at the moment. Please transfer this to Campbell Brown....Joe Johns supposedly just debunked the Palin claims by saying she actually did turn down funding for the bridge to nowhere once it became national news, but he failed to mention that she still took the money (from us, not from oil rich Alaska) and used it to fund other Alaska state expenditures. Couldn't it have been better used to rebuild infrastructure in the lower 48? What she did is like a student getting scholarship money to attend college and then using it to buy a car. If you publish the "no bias, no bull" headline, then tell the entire truth!